BoS Chair, Sharon Bailey explains; “Stockton was an ideal town for the BUF to target as it was hit particularly hard by the 1930’s Great Depression. In Germany, similar towns had fallen under the sway of the Nazis so the BUF expected to be met with a warm welcome. Stockton was by no means unique in attracting the attention of fascist activists during the pre-war years. However, the significance of the “Battle of Stockton” was largely forgotten, unlike the now legendary “Battle of Cable Street” in London which took place 3 years later and is regularly commemorated by residents. 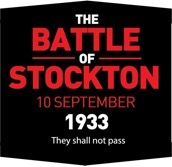 The Battle of Stockton Campaign has been set up as a social history project and aims to have physical memorials of the event placed around the town – such as a mural and a plaque. Plans to host a yearly event on the memorial of the battle with performances, local bands and speakers are already taking shape. An educational outreach is also planned, it aims to disseminate knowledge of the BoS to students and the wider community. Sharon continues; “The Battle of Stockton is an almost forgotten part of our towns history that local people today can feel proud of. We’ve already been contacted by a number of residents telling stories of how their older relatives took part on the day. Campaigners have been making considerable progress towards their goals. Text for a plaque has been finalised and artists for a mural are currently being spoken to. Educational activities about the Battle of Stockton will be presented at the Schools History National Conference this year. Public meetings continue to be held and there are even plans to brew a special ‘Battle of Stockton’ ale by the local Three Brothers Brewery to be sold in local pubs. This entry was posted in Uncategorized on 08/01/2018 by Peter Nicklin.